Kolsch or Kölsch, no matter how you spell it you know what this beer style is like- at least for those of us who’ve immersed ourselves into craft beer; or studied abroad to Germany during sophomore year. This style of beer comes from Cologne, Germany and shines brightly from the glass with its light gold color and traditionally has a slightly dry and crisp finish. You’ll find a Kolsch in most bottle shops or German-inspired restaurant. And soon at Uptown Market! Tyler Staples, Head Brewer, and Brixton Apon, Assistant Brewer, have been busy finishing up and kegging the very first Kolsch for Uptown Market. Traditionally, a Kolsch doesn’t have a big hop profile and uses pale malts and pour a straw color and finish cleanly, with a crisp taste. 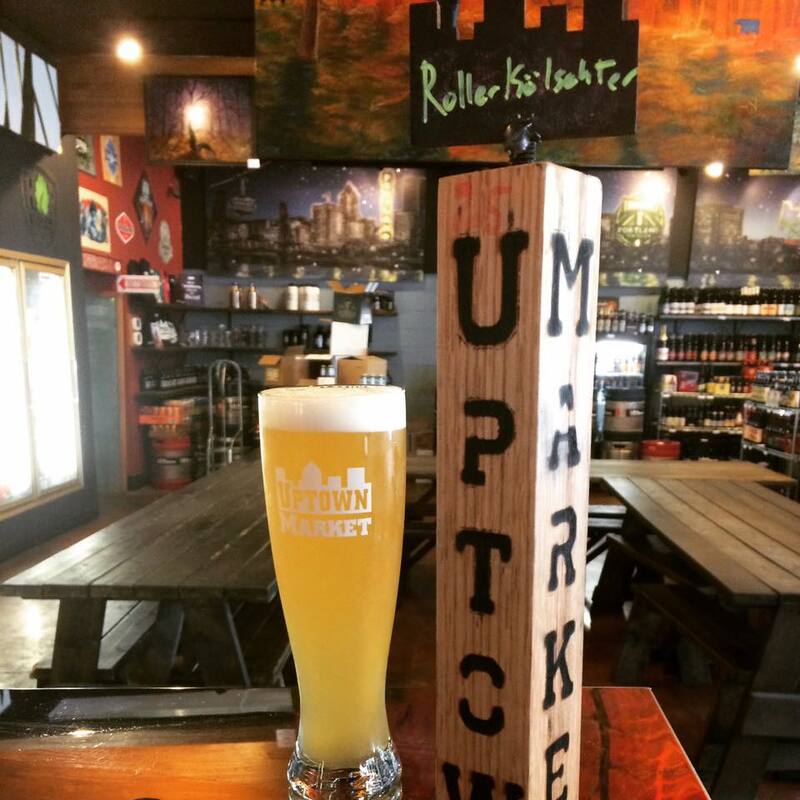 The Uptown Kolsch, named “The RollerKolschster of Love” strays slightly away from the tradition. Brewed with Hallertau Blanc hops from the Hallertau region of Germany, this ingredient will give the finished beer a dry and slightly fruity flavor. The grain bill is the same as a traditional Kolsch and Tyler used a Diter Strain of yeast, with the benefit that it can be brewed at ale temperatures and is a reliable yeast for the beer type, lending the desired Bavarian taste profile without too much banana or clove flavor. The RollerKolschster of Love will be a crisp and clean beer for any beer lover across the spectrum to enjoy. What’s appealing about a Kolsch is that it’s not bombastic, or overly bold; what’s in the beer is what you get. As summer is coming to an end, this is the perfect beer to beat the heat. “This was a labor of love, “ Tyler said. Look for The RollerKolschster of Love in the Scholls Ferry taproom September 1! Thirsty for the real thing? Visit either Uptown Market location!